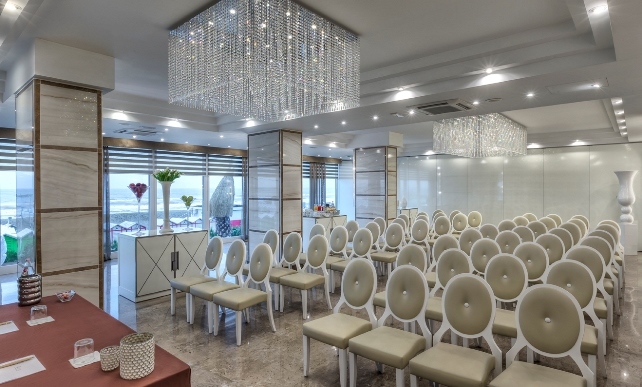 The hotels in Rimini and Riccione that are part of Maximilian’s Hotels group allow you to organise your event by meeting your needs: private meetings, job interviews, board of directors, ceremonies, meetings and bigger events. The seating capacity varies and so do furniture and services while keeping modernity and technology at state of the art levels; everything in order to be perfect for you. In addition, all the hotels will provide an efficient organisation to your meeting. Hotel Ambasciatori is a 4-star superior hotel with a modern multi-function meeting centre that features 4 conference rooms. The bigger space is the Sala Quarzo conference room that can seat up to 200 people and is enlightened by panoramic windows with a partial sea view. For business meetings of medium dimension, Hotel Ambasciatori proposes its Sala Ametista. It can host up to 130 attendee and its shape make it perfect for welcoming an exposition desk. If you prefer a meeting room with a greater privacy you could choose the Sala Giada. This room allows you to hold a small meeting, a training course or work meeting. If you are looking for a space to hold job interviews or as a secretary space, Hotel Ambasciatori features the Sala Topazio. Look up all the information on the website Hotel Ambasciatori with conference rooms in Rimini. 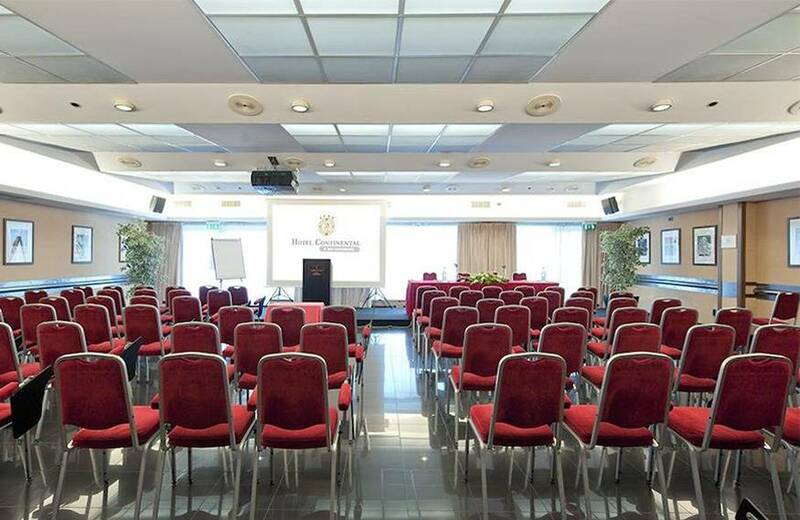 Hotel Sporting Rimini is side-by-side with Hotel Ambasciatori and features 7 conference rooms. The Sala Corallo can seat up to 160 attendees and is the biggest conference room in the hotel. It was recently renewed and features every technology for a confortable meeting. The second biggest is Sala Diamante, a meeting room for up to 80 attendees. 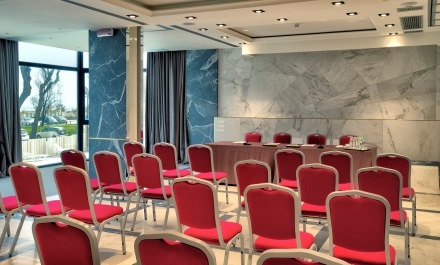 If you need smaller size meeting rooms, Hotel Sporting is there for you with Sala Rubino and Sala Smeraldo, both with a seating capacity of 40 people. For even smaller needs or for job interviews we suggest Sala Giada and Sala Zaffiro that can hold 25 people or Sala Business. Check the official website for further information on Hotel Sporting Rimini with meeting rooms. 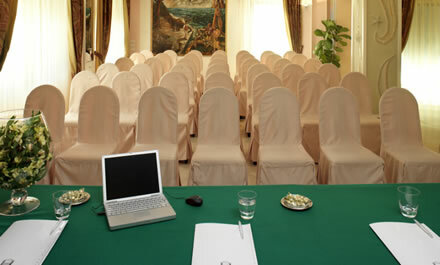 Hotel Continental Rimini has meeting solutions for any kind of event. The meeting room with the higher seating capacity is the Sala Michelangelo with 240 seats but thanks to the 8 different conference rooms it is possible to hold meetings, press conferences, workshops and other needs of personalised spaces. Our conference rooms can have natural light and all of course feature Wi-Fi connection and all the technological devices to make a meeting pleasing. The elegant conference room of Hotel Tiffany’s offers you the availability to organise company meeting at the higher level: just imagine your conference in a sea view room. The room is completely soundproof, with natural light, multi-function and can welcome up to 120 attendees. Of course the service is customisable and ideal if you are looking for a meeting room with flexibility, design and completeness. 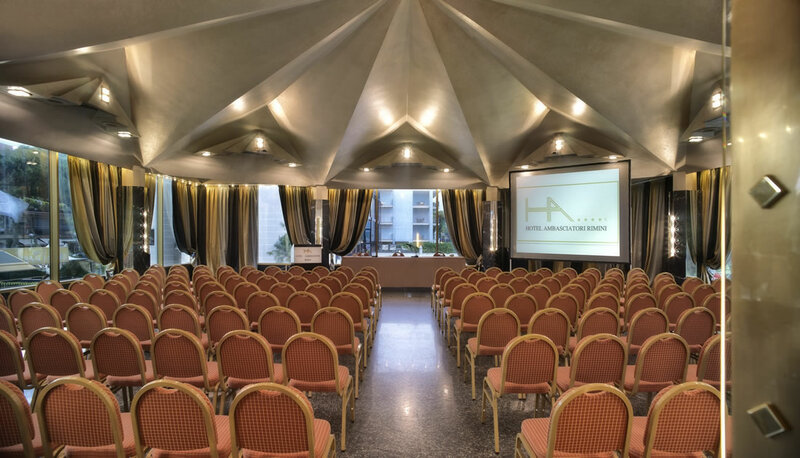 On the official site you can read further information: Hotel Tiffany’s for meeting and conferences in Riccione. Riccione is also the city of Hotel Feldberg, a hotel that is ideal for your business needs, thanks to a series of services that you could enjoy like the free parking and the spa. The conference rooms are designed for attendance of up to 80 people and are ample, light and offer a rich choice of services: from the reception to logistics to restaurant. Among the available services for meetings and conferences in hotel: audio-video system, whiteboards, projector, photocopies, secretary services and much else. Read more on the official site: Hotel Feldberg in Riccione with conference rooms.